Humans have been piecing together an atlas of the heavens for millennia. The advent of gravitational wave astronomy means we can now listen to the rhythms of the cosmos and map uncharted territory. Over a hundred million years ago, two dense, collapsed vestiges of long-dead stars spiralled around each other in the final orbits of a celestial dance. Moments later, the neutron stars plunged violently into each other at a third of the speed of light, creating an explosion so catastrophic that its gravitational disturbance reverberated across the universe. The effects of this cataclysmic collision reached Earth on the morning of 17 August 2017. Gravitational ripples stretched and squeezed spacetime while passing through the Laser Interferometer Gravitational-Wave Observatory (LIGO), allowing us to detect a signal from the now-annihilated neutron stars. But that wasn’t all. Just over two seconds later, a flash of light followed from the cosmic fire that burned in the wake of the collision. At once, a furious flurry of telescopes pivoted to point at the explosion as astronomers tried to capture this historic event. This discovery beckoned a new era of astronomy — for the first time ever we were observing the cosmos through two different physical 'messengers' simultaneously: seeing the blaze from the explosion as well as hearing the characteristic 'chirp' of a gravitational wave. For millennia we have extensively studied and mapped the universe by detecting light with increasingly expensive and sophisticated telescopes. Now that gravitational waves have become visible to us, we can 'see' dark things like black holes and may even discover exotic celestial bodies that we didn’t even know existed, such as wormholes or boson stars. Like the ancient astronomers, we are pioneers again, not knowing what we will discover next. But we have an advanced toolkit — it is perhaps far more impressive that our ancestors mapped their place in the cosmos with primitive telescopes or simply their naked eyes. The celestial lights that adorn our sky have always captured the imaginations of humans across cultures. Indeed, the first maps recorded the patterns of the night sky, rather than the terrain of Earth. The night sky can be imagined as a celestial sphere that encircles our planet, with celestial latitudes and longitudes (called declination and right ascension respectively) marking out coordinates. Just as we draw borders between different countries on Earth based on politics and culture, the night sky can be divided into constellations to mirror our Earthly experiences. As we travel south along the surface of the celestial sphere, we arrive at the zodiacal constellations that align with plane of the solar system (which lies 23.5° above the celestial equator); then the equatorial constellations sit below the zodiac along the equator of the sphere. Because the Zodiac corresponds to the course taken by the planets and Sun through the sky, it was believed to hold power in the Babylonian tradition, leading to the system of Zodiac astrology still in widespread use in western culture. Southern constellations were identified and documented by ancient cultures such as Aboriginal Australians and the Inca in Peru. With a culture stretching back to 60,000 BC, Aboriginal Australians have been dubbed “the world's first astronomers”, having long used the night sky for timekeeping and navigation. “The Southern Sky brings the galactic centre overhead and a much richer group of bright stars and dark clouds,” says Penprase. 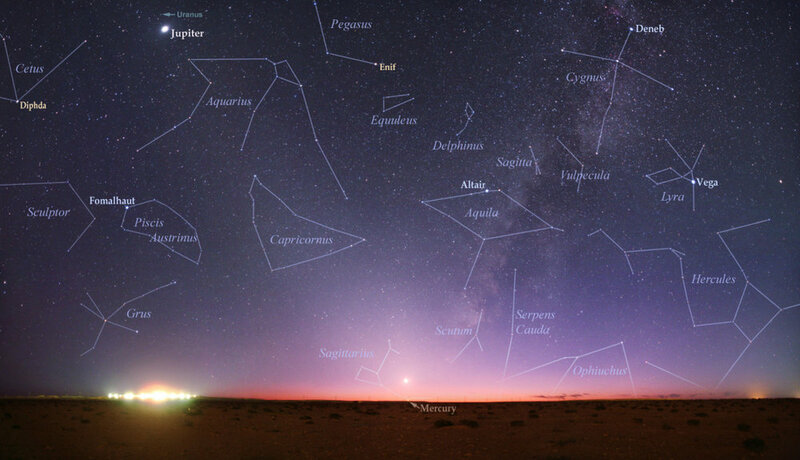 Southern astronomy is unique in its emphasis on the dark patches in the sky, unlike the Greek tradition which focuses on mapping the positions of stars. Many Aboriginal groups across Australia see the dark patches strewn through the Milky Way as the outline of a resting emu. This “Emu in the Sky” would change its orientation over the course of the year — either ‘running’ or ‘sitting down’ — thereby signalling whether it was time to hunt for emus or collect their eggs. Many northern hemisphere cultures were even aware of the precession of the equinoxes, a process that has a period of 26,000 years and would appear as a gradual tilting of the celestial poles. Detecting this phenomenon would have required recollections of the sky for at least a millennium. Even though modern technology has made maps more precise, Wiesenfeldt maintains that the craft of mapping the sky itself “has probably changed very little,” with ancient stargazing having laid the groundwork for modern astrophysics. In the past, mapping the stars was a practical necessity and a mystical fascination, but in the modern era it is largely an intellectual curiosity. Wiesenfeldt points out that we don’t need the stars for calendrical purposes any more and that “GPS has replaced the need for celestial observations to find your way”. Nonetheless, global scientific collaborations now allow us to produce incredibly detailed and comprehensive maps of the universe. So how exactly is this done? 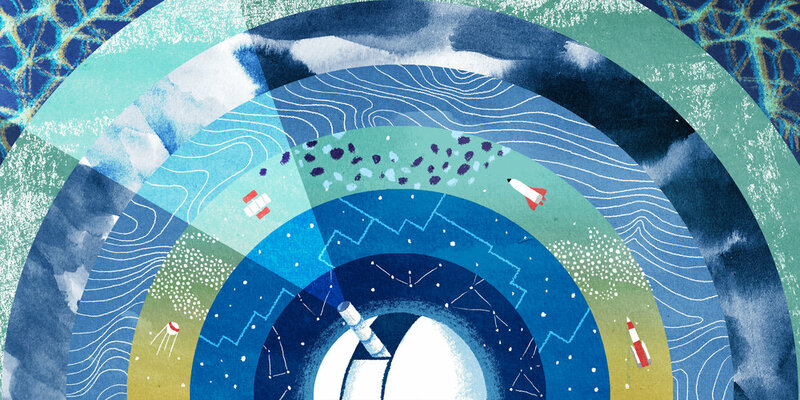 To create a map of the world, we can visit almost any place on Earth and survey it. But when we map the universe, we can’t just jump in a rocket and jet off across space. Instead, we rely on “messengers” travelling from remote regions to deliver us information about where they came from and the objects that produced them. Typically, these messengers are photons — tiny packets of light that are emitted by celestial objects such as stars. Ancient maps of the night sky are projected maps, showing the sky as if it were a spherical backdrop with pinpricks of light glued on — with no information about far each of those stars or galaxies is from Earth. Astronomers needed to make three dimensional maps in order to fully map out the distribution of stars and galaxies. The universe helps us in this endeavour; as it expands, it stretches out the waves of light sent to us by distant sources. This makes the light slightly redder, allowing astronomers to determine how far the light has travelled and therefore determine the distances to objects. Because the light takes more time to travel to us if its source is further away, we are also looking back in time, so we can map not just how the universe looks now, but also how it looked when it was younger. 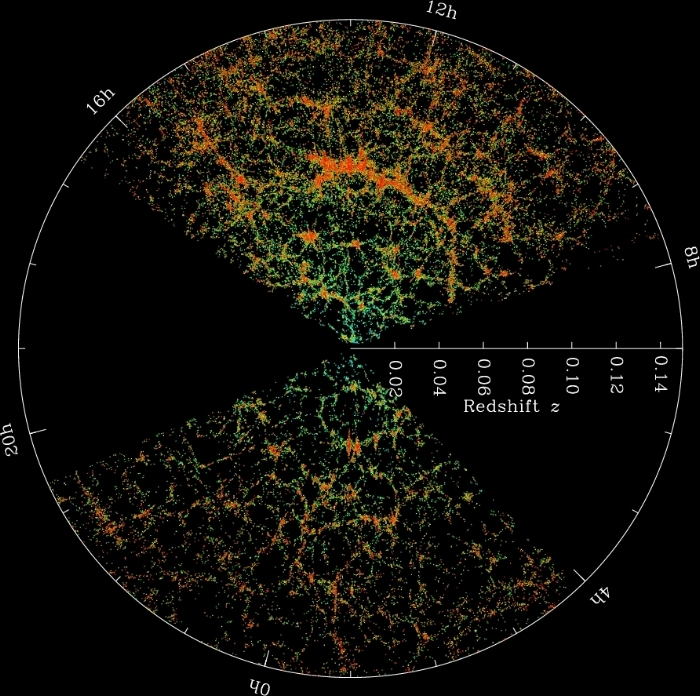 The CfA Redshift Survey was the first three-dimensional survey that was both wide (surveying a large area of sky) and deep (probing large distances beyond the Local Supercluster, the group of galaxy clusters that the Milky Way lives in). The survey was largely carried out using a small 1.5 metre telescope from 1977 to 1982 and it sampled thousands of galaxies — enough to see that they formed an intricate pattern of empty voids and long filamentary structures. Unfortunately, it was challenging to investigate the shape of these intriguing structures due to how few galaxies were sampled. So in order to properly map these patterns, it was necessary to have not just a three-dimensional survey, but one that also contains a lot of galaxies. The Sloan Digital Sky Survey (SDSS) filled this need, containing millions of objects and imaging one third of the sky to produce the most detailed three-dimensional maps of the universe ever made. Most survey telescopes (like the SDSS) tend to look at visible wavelengths — the kind of light we can see with our eyes. When using an optical telescope, the gaps between stars and galaxies will typically be dark. But sensitive radio telescope will see a faint but perceptible background glow in these regions. Called the Cosmic Microwave Background (CMB), this is the relic radiation from the aftermath of the Big Bang. It imprinted on the sky when the universe was 380,000 years old — making the CMB the oldest light in our universe. It is a snapshot of light escaping from a hot, dense plasma of interacting protons and electrons, and by observing it we can travel further back in time than with the SDSS. The Planck Telescope was constructed for exactly this purpose — to create the most detailed map ever of the CMB. 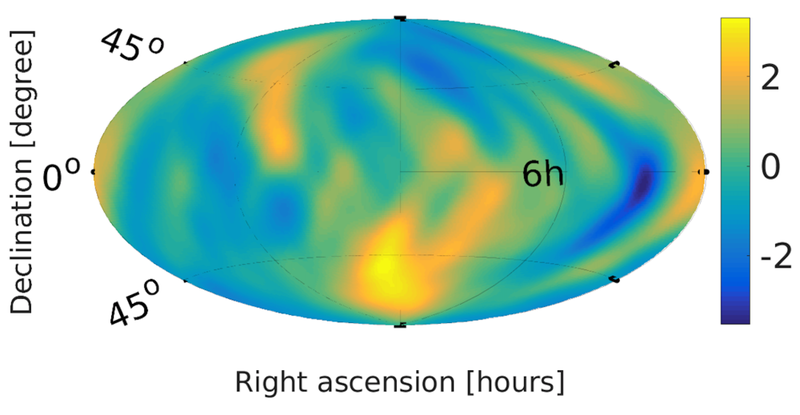 The high-resolution maps that Planck has produced reveal that the CMB is speckled with tiny temperature fluctuations. The higher temperature regions correspond to where there was a slightly denser region in the plasma of the early universe. Cosmologists understand that these tiny “overdensities” seeded the formation of large structures, such as galaxies — so Planck’s maps allow us to understand the structure of the universe throughout its entire history. But some objects, such as black holes, don’t emit electromagnetic radiation that we can observe, meaning that our maps would have always remained incomplete — if not for gravitational wave astronomy. Gravitational waves are not just a groundbreaking discovery in and of themselves — they are a tool we can use to explore unsolved astrophysical mysteries for years to come. “Gravitational waves are not scattered or absorbed as they pass through matter,” explains Andrew Melatos, professor of astrophysics at the University of Melbourne and member of the LIGO Scientific Collaboration (LSC). So unlike light, which bounces around as it encounters obstacles while traversing the Universe, we can use gravitational waves as a “long-range probe” of the cosmos. Experts eagerly anticipate the results of this new era of gravitational wave astronomy and the potential to discover objects that were previously invisible to us. “There is a huge discovery space out there: as long as we have a civilisation we will look for gravitational waves,” says Melatos. This emerging field is so significant that the Australian government has invested in a new Australian Research Council Centre of Excellence called OzGrav, a collaboration of scientists from around the country created in order to advance gravitational wave astronomy. Just as the CMB is a background of electromagnetic radiation from the early universe, we also expect to find a background of gravitational radiation. This background is likely to arise from two different sources: (1) an 'astrophysical' background from merging black holes that are too weak to see individually but still contribute to the overall gravitational wave signal and (2) a cosmological gravitational wave background (CGWB) that is the gravitational analogue of the CMB, except it arises from processes that occur even further back in time, allowing us to probe the physics of the early universe moments after the Big Bang. Detecting an astrophysical gravitational wave background will allow us to observe gravitational waves from much more distant sources than would be possible when observing individual events. Thrane says we can use measurements of the astrophysical background to “infer how populations of black holes evolve over the history of the universe”, perhaps achieving this detection in the next year or two. Even more excitingly, gravitational waves may help us map the universe right back at the moments of its birth. We currently can’t see further back than the CMB — 380,000 years ago — because when the photons bounced aimlessly around the particle soup in the wake of the Big Bang, their random paths essentially erased electromagnetic information from that period. We could also search for primordial gravitational waves indirectly, by looking for their imprint on the cosmic microwave background, which may be plausible within the next decade. Despite millennia of human effort, our atlas of the universe is far from complete. Many secrets remain hidden from view, some of which we are only now beginning to unlock with the power of gravitational waves. And it doesn’t stop there — there are even more celestial 'messengers' beyond gravitational and electromagnetic waves, such as cosmic neutrinos. If the past is anything to go by, making sense of the rhythms of the cosmos is humankind’s enduring obsession, and we are unlikely to stop anytime soon.